You have probably seen cattle fed on round bales. Perhaps the farmer was moving them with the tractor and you have wondered if these bales were an acceptable alternative feed for your horses. Sure, you would need a tractor or at lest a bale fork, but considering the size, this move might well be worth it. On the other hand, how do you know that the bales are nutritionally sound and devoid of unhealthy molds? While there is not definite answer, the general consensus seems to be that feeding round bales to horses is advantageous. do not require this labor. Of course, since the round bales are much bigger than the square ones and thus last for a loner period of time, long term storage needs to be carefully contemplated. Many experts suggest that round bales should be fed under cover, such as a run-in shed, where feeders could be located. The feeder itself needs to be little more than some corral panels where horses can stick their heads through. It is not necessary to incur the expense of a commercial bale feeder, especially considering that most of these are manufactured for cattle and thus not tall enough for a horse. There have actually been cases where horses have managed to bend the feeders. Of course, by far the biggest concern for horse owners is the nutritional value of the big bales. Some are concerned that the shape contributes to the formation of mold which is dangerous to the animals, while others wonder if these bales contain high amounts of dust. Once again the experts have researched the matter and have come to a verdict. 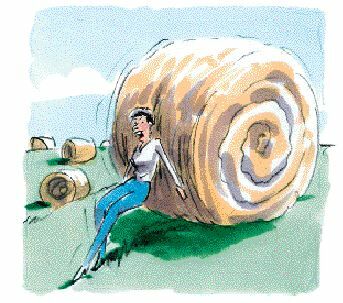 While it is possible to find round bales that are contaminated with molds and rather dusty, the actual quality of the bales depends on the quality of the grass from which they are cut and not on the shape in which they are delivered. As such, it is possible to have dust and also mold in square bales if they are not properly stored on pallets to reduce ground moisture from seeping into the bales immediately after cutting. Similarly, if they are not stored indoors, then the quality of the bales may be compromised. Experts have one final tip for feeding round bales: offer a new bale before the last one is gone. Horses generally do not like to eat the outside but love eating through the ends of a bale! Read the next horse pasture article on Fescue Grasses Problems.